"Kleine Partie" - Trachtenkapelle Lech - mehr geht nicht! The "little oompah-band" is a condensed version of the larger town band. 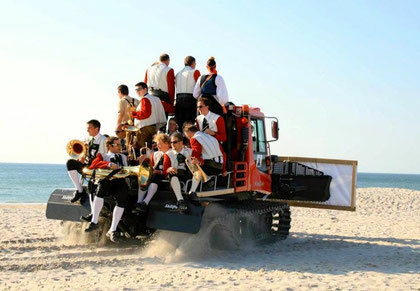 This ensemble plays at all sorts of occasions throughout the year - whether it be local festivals, birthday celebrations, presentation ceremonies honouring long-standing guests or for the European Forum. Everywhere and any time in Lech and Zürs this ensemble is gladly seen and heard. Even well beyond the Arlberg have these valiant musicians been sighted. Their repertoire consists mainly of traditional Austrian and Bohemian band music; marches, polkas and waltzes. However, every once in a while contemporary sounds do escape. This group of highly enthusiastic players will readily travel the world (naturally at your expense), adding dignity to any occasion and/or providing a singular atmosphere with their inescapable humour and joviality.